The 1974 Tour de France was the 61st edition of the Tour de France, one of cycling's Grand Tours. It took place between 27 June and 21 July, with 22 stages covering a distance of 4,098 km (2,546 mi). 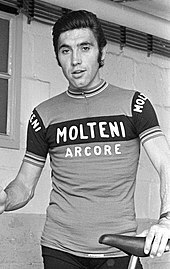 Eddy Merckx was attempting to win his fifth Tour de France in as many races, while Luis Ocaña and Joop Zoetemelk were notable absentees from the 1974 Tour. In 1974 the tour made its first visit to the United Kingdom, with a circuit stage on the Plympton By-pass, near Plymouth, England. The race was won by favourite Eddy Merckx, who thus at that point had won all five Tours that he had entered, and had equalled Jacques Anquetil in Tour victories. Merckx also won the combination classification. Fellow Belgian Patrick Sercu won the points classification, while Spanish Domingo Perurena won the mountains classification. For a more comprehensive list, see List of teams and cyclists in the 1974 Tour de France. The 1974 Tour de France had 13 teams, with 10 cyclists each. Eddy Merckx, who had been absent in 1973 after winning four Tours in a row, was present again. Merckx had not been as dominant in the spring as in other years; it was his first year as a professional cyclist in which he did not win a spring classic. He did win the 1974 Giro d'Italia and the Tour de Suisse, but after winning the latter he required surgery on the perineum, five days before the 1974 Tour started. Notable absents were Ocaña and Zoetemelk. Zoetemelk was injured during the Midi Libre and was in hospital with life-threatening meningitis. Between 1970-1986 this would be the only Tour Zoetemelk would not start and finish, and would be the only Tour until 1983 that he was not in the top ten. Ocaña had crashed in the Tour de l'Aude, gone home and was fired by his team for not communicating. Bernard Thevenet, who was considered a potential winner, had crashed several times in the 1974 Vuelta a España. He did start in the Tour, but was not yet back at his former level. The 1974 Tour de France started on 27 June, and had two rest days, in Aix-les-Bains and Colomiers. Merckx won the prologue, with his team mate Joseph Bruyère in third place. In the first stage, Bruyère was part of a breakaway, and became the new leader. The second stage was in Plymouth, the first time that the Tour de France visited England. The riders did not like the experiment, as the British immigration officials made the cyclists wait for a long time when entering the country and again when returning to France. Merckx collected bonus time in the sprints, and in the fourth stage took back the leading position in the general classification, with Gerben Karstens in second place. Karstens was also doing well in the points classification, and felt Merckx and Patrick Sercu, the leaders in the general and points classification, were helping each other. [n 1] Karstens was angry and after the finish quickly went away, but forgot that he had to go to the doping control. For this, he was given ten minutes penalty time, and thus he lost his second place in the general classification. Karstens complained to the jury, and other cyclists threatened with a strike, so the jury removed the penalty after the fifth stage. Thanks to bonification seconds in that stage, Karstens took the leading position after that stage. It was still close in the top of the general classification. Patrick Sercu became the new leader after the first part of the sixth stage, but Karstens regained the lead after the second part of the sixth stage, a team time trial won by Merckx's team, Molteni. Merckx won the seventh stage, and became the next leader. The Alps were the first serious mountains to be seen, in stage nine. Merckx won the stage, but the surprise of the day was Raymond Poulidor, who at 38 years old was still able to escape during the toughest part of the stage. This also happened in the tenth stage: Poulidor joined the crucial escape, but could not beat Merckx in the final sprint. In the tenth stage, the hardest Alpine stage, Vicente Lopez Carril from the KAS team stayed away. Merckx was in the next group, together with Francisco Galdós and Gonzalo Aja, also from the KAS team. Aja was in third place in the general classification, so Merckx was unable to chase Lopez Carril without helping his rival Aja. The next stages did not change the general classification. In the fifteenth stage, the Pyrenées were encountered. There was a crash that took down Galdós, now in sixth place in the general classification, and he had to leave the race. The Tour was in Spain at that point, and Basque separatist placed bombs on press and team cars. Nobody was hurt, but cyclists were scared: Spanish champion Lopez Carril did not wear his national champion's jersey, afraid to become a target because of the Spanish flag on it. In the sixteenth stage, with an uphill finish, Poulidor won, his first Tour stage victory since 1965. Merckx finished in fourth place, losing time to Poulidor, Lopez Carril and Pollentier. In the seventeenth stage, Poulidor again won time, finishing second after Jean-Pierre Danguillaume, and jumped to the third place in the general classification, behind Merckx and Lopez Carril. Danguillaume also won the eighteenth stage, the last mountain stage. The favourites stayed together with Merckx, and at that point Merckx was more or less certain of the victory, with two time trials remaining, in which he normally would gain time on the others. Poulidor battled with Lopez-Carril for the second place. After the time trial in the second part of stage 21, Poulidor captured the second place by just one second. Surprisingly, Merckx was in second place in that time trial, beaten by Michel Pollentier. In the last stage, Poulidor increased the margin to Lopez Carril to five seconds due to bonus seconds. There were several classifications in the 1974 Tour de France, three of them awarding jerseys to their leaders. The most important was the general classification, calculated by adding each cyclist's finishing times on each stage. The cyclist with the least accumulated time was the race leader, identified by the yellow jersey; the winner of this classification is considered the winner of the Tour. There was also a mountains classification. The organisation had categorized some climbs as either first, second, third, or fourth-category; points for this classification were won by the first cyclists that reached the top of these climbs first, with more points available for the higher-categorized climbs. The cyclist with the most points lead the classification, but was not identified with a jersey in 1974. The fifth individual classification was the intermediate sprints classification. This classification had similar rules as the points classification, but only points were awarded on intermediate sprints. In 1974, this classification had no associated jersey. The combativity award was given to Eddy Merckx. Eddy Merckx (BEL) Molteni 116h 16' 58"
Raymond Poulidor (FRA) Gan–Mercier–Hutchinson + 8' 04"
Vicente López Carril (ESP) Kas–Kaskol + 8' 09"
Wladimiro Panizza (ITA) Brooklyn + 10' 59"
Gonzalo Aja (ESP) Kas–Kaskol + 11' 24"
Joaquim Agostinho (POR) Bic + 14' 24"
Michel Pollentier (BEL) Carpenter–Confortluxe–Flandria + 16' 34"
Mariano Martínez (FRA) Sonolor–Gitane + 18' 33"
Alain Santy (FRA) Gan–Mercier–Hutchinson + 19' 55"
Herman Van Springel (BEL) MIC–Ludo–de Gribaldy + 24' 11"
Roger Pingeon (FRA) Jobo–Lejeune + 26' 50"
Raymond Delisle (FRA) Peugeot–BP–Michelin + 28' 59"
Jean-Pierre Danguillaume (FRA) Peugeot–BP–Michelin + 29' 43"
Juan Santiago Zurano (ESP) La Casera–Peña Bahamontes + 30' 20"
André Romero (FRA) Jobo–Lejeune + 31' 35"
Michel Perin (FRA) Gan–Mercier–Hutchinson + 31' 57"
Miguel Maria Lasa (ESP) Kas–Kaskol + 32' 55"
Lucien Van Impe (BEL) Sonolor–Gitane + 37' 35"
Andrês Oliva (ESP) La Casera–Peña Bahamontes + 37' 48"
Bernard Labourdette (FRA) Bic + 38' 02"
Joseph Bruyère (BEL) Molteni + 41' 31"
Edouard Janssens (BEL) Molteni + 44' 30"
Fausto Bertoglio (ITA) Brooklyn + 45' 43"
Willy Van Neste (BEL) Sonolor–Gitane + 46' 50"
Ronald De Witte (BEL) Carpenter–Confortluxe–Flandria + 47' 10"
Giancarlo Bellini (ITA) Brooklyn + 47' 46"
Fedor Iwan den Hertog (NED) Frisol–Flair Plastics + 50' 28"
José Catieau (FRA) Bic + 51' 11"
José Pesarrodona (ESP) Kas–Kaskol + 53' 44"
Georges Pintens (BEL) MIC–Ludo–de Gribaldy + 56' 43"
Joël Millard (FRA) Merlin Plage–Shimano–Flandria + 57' 08"
Ferdinand Julien (FRA) Sonolor–Gitane + 1h 00' 06"
Roland Berland (FRA) Bic + 1h 01' 13"
Régis Ovion (FRA) Peugeot–BP–Michelin + 1h 05' 22"
Marc Lievens (BEL) Molteni + 1h 09' 16"
Victor Van Schil (BEL) Molteni + 1h 12' 37"
Barry Hoban (GBR) Gan–Mercier–Hutchinson + 1h 13' 11"
Gerrie Knetemann (NED) Gan–Mercier–Hutchinson + 1h 14' 15"
Francis Campaner (FRA) Jobo–Lejeune + 1h 16' 19"
Antonio Martos (ESP) Kas–Kaskol + 1h 18' 02"
Marc Demeyer (BEL) Carpenter–Confortluxe–Flandria + 1h 18' 28"
Luis Zubero (ESP) Kas–Kaskol + 1h 19' 12"
Arturo Pecchielan (ITA) Brooklyn + 1h 19' 15"
Domingo Perurena (ESP) Kas–Kaskol + 1h 19' 18"
Jos Deschoenmaecker (BEL) Molteni + 1h 19' 36"
Jesus Manzaneque (ESP) La Casera–Peña Bahamontes + 1h 19' 54"
Jean-Claude Misac (FRA) Merlin Plage–Shimano–Flandria + 1h 23' 26"
Christian Blain (FRA) Jobo–Lejeune + 1h 23' 52"
Carlos Melero (ESP) Kas–Kaskol + 1h 25' 17"
Joseph Spruyt (BEL) Molteni + 1h 25' 41"
Sylvain Vasseur (FRA) Bic + 1h 26' 37"
Bernard Bourreau (FRA) Peugeot–BP–Michelin + 1h 27' 07"
Jan Van De Wiele (BEL) MIC–Ludo–de Gribaldy + 1h 28' 25"
Antonio Menendez (ESP) Kas–Kaskol + 1h 30' 43"
André Dierickx (BEL) Merlin Plage–Shimano–Flandria + 1h 32' 18"
Gerard Vianen (NED) Gan–Mercier–Hutchinson + 1h 36' 27"
Michael Wright (GBR) Sonolor–Gitane + 1h 38' 11"
Ludo Delcroix (BEL) Molteni + 1h 38' 13"
André Mollet (FRA) Peugeot–BP–Michelin + 1h 38' 40"
José Luis Abilleira (ESP) La Casera–Peña Bahamontes + 1h 39' 12"
Gerben Karstens (NED) Bic + 1h 39' 19"
Damaso Torres (ESP) La Casera–Peña Bahamontes + 1h 40' 11"
Gustaaf Van Roosbroeck (BEL) MIC–Ludo–de Gribaldy + 1h 41' 11"
Alain Nogues (FRA) Sonolor–Gitane + 1h 42' 17"
Willy Teirlinck (BEL) Sonolor–Gitane + 1h 47' 11"
Jos Huysmans (BEL) Molteni + 1h 49' 00"
Jean-Pierre Genet (FRA) Gan–Mercier–Hutchinson + 1h 49' 02"
Jean-Jacques Sanquer (FRA) Merlin Plage–Shimano–Flandria + 1h 50' 29"
Valerio Lualdi (ITA) Brooklyn + 1h 51' 22"
Noël Vanclooster (BEL) MIC–Ludo–de Gribaldy + 1h 51' 24"
Guy Sibille (FRA) Peugeot–BP–Michelin + 1h 52' 44"
Gerard Moneyron (FRA) Merlin Plage–Shimano–Flandria + 1h 53' 52"
Wilfried Wesemael (BEL) MIC–Ludo–de Gribaldy + 1h 54' 09"
Charles Rouxel (FRA) Peugeot–BP–Michelin + 1h 54' 22"
Jacques Esclassan (FRA) Peugeot–BP–Michelin + 1h 56' 47"
Christian Raymond (FRA) Gan–Mercier–Hutchinson + 1h 57' 36"
Daniel Rebillard (FRA) Merlin Plage–Shimano–Flandria + 1h 58' 03"
Wim Prinsen (NED) Frisol–Flair Plastics + 1h 58' 50"
Raymond Riotte (FRA) Peugeot–BP–Michelin + 1h 59' 51"
Jacky Mourioux (FRA) Gan–Mercier–Hutchinson + 2h 00' 06"
Alain Vasseur (FRA) Bic + 2h 01' 28"
Claude Magni (FRA) Jobo–Lejeune + 2h 06' 03"
Frans Mintjens (BEL) Molteni + 2h 06' 43"
Henk Prinsen (NED) Frisol–Flair Plastics + 2h 10' 09"
Jean-Pierre Guillemot (FRA) Jobo–Lejeune + 2h 12' 12"
Jacques Botherel (FRA) Sonolor–Gitane + 2h 12' 37"
Robert Mintkiewicz (FRA) Sonolor–Gitane + 2h 16' 05"
Ronny Vanmarcke (BEL) MIC–Ludo–de Gribaldy + 2h 17' 34"
Patrick Sercu (BEL) Brooklyn + 2h 18' 58"
Daniel Ducreux (FRA) Jobo–Lejeune + 2h 19' 20"
Gianni Di Lorenzo (ITA) Brooklyn + 2h 20' 52"
Bernard Croyet (FRA) Bic + 2h 23' 57"
Dirk Baert (BEL) MIC–Ludo–de Gribaldy + 2h 24' 45"
Fernando Plaza (ESP) La Casera–Peña Bahamontes + 2h 28' 19"
Michel Coroller (FRA) Merlin Plage–Shimano–Flandria + 2h 36' 59"
Arthur Van de Vyver (BEL) Carpenter–Confortluxe–Flandria + 2h 38' 42"
Aldo Parecchini (ITA) Brooklyn + 2h 41' 11"
Alain Cigana (FRA) Jobo–Lejeune + 2h 42' 24"
Frans Van Looy (BEL) Carpenter–Confortluxe–Flandria + 2h 46' 03"
Daniel Verplancke (BEL) Carpenter–Confortluxe–Flandria + 2h 46' 38"
Regis Delepine (FRA) Merlin Plage–Shimano–Flandria + 2h 55' 42"
Piet van Katwijk (NED) Frisol–Flair Plastics + 2h 58' 39"
Donald John Allan (AUS) Frisol–Flair Plastics + 3h 06' 53"
Bernard Masson (FRA) Jobo–Lejeune + 3h 16' 56"
Lorenzo Alaimo (ITA) Frisol–Flair Plastics + 3h 55' 46"
Jobo–Lejeune + 1h 01' 09"
Peugeot–BP–Michelin + 1h 15' 24"
La Casera–Peña Bahamontes + 1h 34' 47"
MIC–Ludo–de Gribaldy + 1h 36' 35"
First man to win the Tour de France, Giro d'Italia and Tour de Suisse in one year. Merckx had already won the 1974 Giro d'Italia earlier that year, and after winning the 1974 Tour de France also won the world championship, and became the first cyclist to win the Triple Crown of Cycling. ^ Merckx and Sercu were in different teams, but were good friend, and in winters rode together in six-day racing. ^ a b c d e f "61ème Tour de France 1974" (in French). Mémoire du cyclisme. Archived from the original on 29 June 2012. Retrieved 26 September 2016. ^ a b c d e f g h i j k l m n o p McGann & McGann 2008, pp. 81–88. ^ a b c Augendre 2016, p. 65. ^ Zwegers, Arian. "Tour de France GC top ten". CVCC. Archived from the original on 10 June 2009. Retrieved 17 May 2011. ^ a b "Tour de France: The disastrous 1974 Plymouth stage". BBC News. Retrieved 3 July 2014. ^ "61ème Tour de France 1974 - 4ème étape" (in French). Mémoire du cyclisme. Archived from the original on 3 April 2012. Retrieved 26 September 2016. ^ "61ème Tour de France 1974 - 5ème étape" (in French). Mémoire du cyclisme. Archived from the original on 3 April 2012. Retrieved 26 September 2016. ^ "61ème Tour de France 1974 - 16ème étape" (in French). Mémoire du cyclisme. Archived from the original on 4 August 2011. Retrieved 26 September 2016. ^ a b "Tombés au champs d'honneur". Magazine Sport & Vie (in French). Dopage.com. July 2003. Archived from the original on 13 December 2007. Retrieved 30 March 2011. ^ "Guimard positief". Leidsche courant. Regionaal archief leiden. 18 July 1974. p. 13. Archived from the original on 7 October 2011. Retrieved 30 March 2011. ^ "Tour panorama". Gazet van Antwerpen (in Dutch). 22 July 1974. p. 19. Archived from the original on 14 February 2019. ^ van den Akker, Pieter. "Informatie over de Tour de France van 1974" [Information about the Tour de France from 1974]. TourDeFranceStatistieken.nl (in Dutch). Archived from the original on 2 March 2019. Retrieved 2 March 2019. ^ a b c d e "Clasificaciones oficiales". El Mundo Deportivo (in Spanish). 22 July 1974. p. 19. Retrieved 20 August 2011.